"Is there an exam average that instructors should be aiming for with exams? I hear that an average of 80 is good with at least half the class above 80. Is there any rhyme or reason to this?" This is an interesting question, and one that people tend to disagree about. My response assumes that this question is asked regarding grading exams, as usually this is when most people ask this question. However, this also seems to suggest that you can control this distribution. Of course, you can if you choose to grade on a curve. Grading on a curve is generally not advised, however, as it can have many unintended consequences. 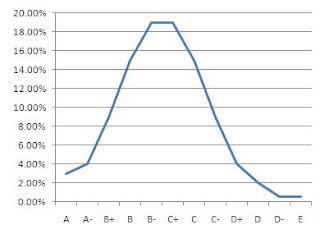 For example, students generally don't understand that if you are truly grading on a curve, their grade could potentially go down in order for you to be able to fill the "quotas" you've created (e.g., half of the class gets less than a B-). Also, it creates a situation in which students are assessed based on the performance of others in the class, as opposed to being evaluated against a set of standard criteria. I always tell my students that I will be happy to give them all As if they all exceed the expectations set out at the beginning of the course. This doesn't mean that you should norm your grades around a C either. What it means is that we need to set standards for performance in our classes, be clear about what is required to earn a particular grade, and then evaluate students according to those standards. Of course, looking at the grade distribution can be helpful. Once you have graded exams or papers against your preset criteria, I do suggest plotting out the grades to see the resulting distribution. If it is positively skewed (meaning that the majority of the grades are above a C), you may want to review the assignment to ensure it was sufficiently challenging given the requirements of the course, and was designed such that it could discriminate between average and excellent work. If so, congratulations - this may be a sign that you are an effective instructor and your students worked hard to learn the material. 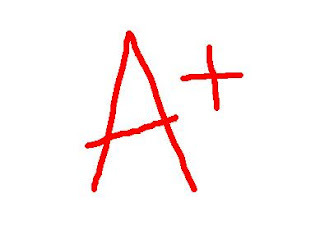 If the grades are negatively skewed (meaning usually that a lot of people failed), you may find that your test was too difficult, or did not adequately represent the material covered (it's probably unusual to have an entire class of students who simply don't put in the work). In these cases, you may want to do an item analysis (review the pattern of responses for each question in turn), and drop the items that you deem unfair or ineffective from the assignment. This allows you to bump up grades based on standards relevant to the course material, not simply due to poor grades. Finally, it is not unusual to see a bimodal distribution (where many students did very well, and another subset of students performed quite poorly). Again, I would do an item analysis, but if everything seems to look kosher (the questions seem fair, there wasn't anything special about the group who performed poorly, such as all being from a preexisting group such as ESL students), you can probably chalk this up to a small group of students failing to adequately prepare.